The Sony Dual Shock 3 – Black (PS3) controller is designed to be used with the PlayStation 3 system and makes the game play more interesting. The controller has pressure sensors in the each action button and includes sensitive SIXAXIS motion sensing technology. It senses your move so that you can enjoy high precision interactive play. Whenever users crash or hit something in the game, they feel the rumble in their palm through the Sony Dual Shock 3 – Black (PS3). 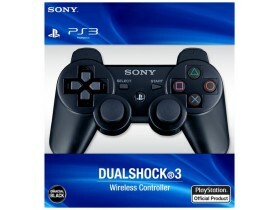 The sixaxis DualShock 3 controller uses Bluetooth technology that helps you to enjoy wireless game. Charging the Bluetooth PS3 DualShock 3 wireless controller is very convenient with the USB cable that can be connected with the system.